Takata will make a formal decision about the bankruptcy filing at its board meeting this month, the leading business daily Nikkei reported, without citing sources. American autoparts maker Key Safety Systems, owned by China's Ningbo Joyson Electronic, will take over Takata's operations, the report said. Takata's US-based unit TK Holdings' board is expected to approve a filing for Chapter 11 bankruptcy there later this month, Nikkei said. Takata officials were not immediately available to comment on the report. Following the report, trading of Takata shares were suspended on the Tokyo Stock Exchange to give investors time to confirm it. Nearly 100 million cars, including about 70 million in the United States, were subject to the airbag recall, the largest in auto history, over the defective Takata airbags blamed for 11 deaths in the United States alone. Last month, four automakers including Toyota and BMW agreed to pay $553 million to settle a US lawsuit over the airbags. The lawsuit filed in late February claimed the carmakers were aware of the dangerous defects and used the airbags in their vehicles anyway. Nearly 16 million cars were involved. Takata pleaded guilty to fraud in February and agreed to pay a $1 billion penalty to settle the issue with US regulators. 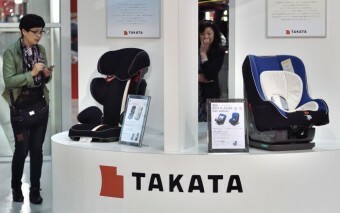 The Friday report said a new company created under Key Safety will purchase Takata operations for about 180 billion yen ($1.6 billion) and continue supplying air bags, seat belts and other products. The downsized Takata will remain responsible for recall-related liabilities, it said. All you have to do is buy shares in the right company and you'll receive some of its earnings.